Here it is: the third Friday of The REAL Studio Tour -- and time for the overall view! I've been really impressed by some of the storage and work-space ideas I've seen this week. I can't really change up much of what I'm currently doing, but as opportunities arise, who knows? I've labelled some of the features. In the centre you see my cutting table/ironing surface (I lust after elle's behind-the-door ironing board!!). Underneath the table on all sides are storage bins on wheels. The ones you can't see -- on the side across from my sewing machine and sewing table -- hold yarn. The sewing machine is embedded in the table, but can be raised up so I can use the free-arm -- handy when sewing those boxer shorts! It also has a drawer to the left of the chair which contains my button box, most-used threads, walking foot, and instructions for the machine. When fully open, the drawer can be covered by a flat piece that extends the sewing area, perfect for quilting larger pieces. 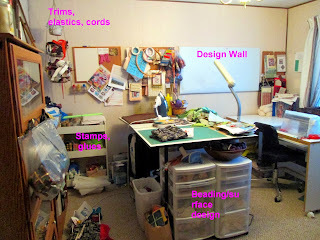 In addition to my design wall on the west side of the room, you see my whiteboard/cork-board inspiration centre, a peg-board that holds embroidery supplies, and another smaller peg-board (near the corner) that holds patterns. 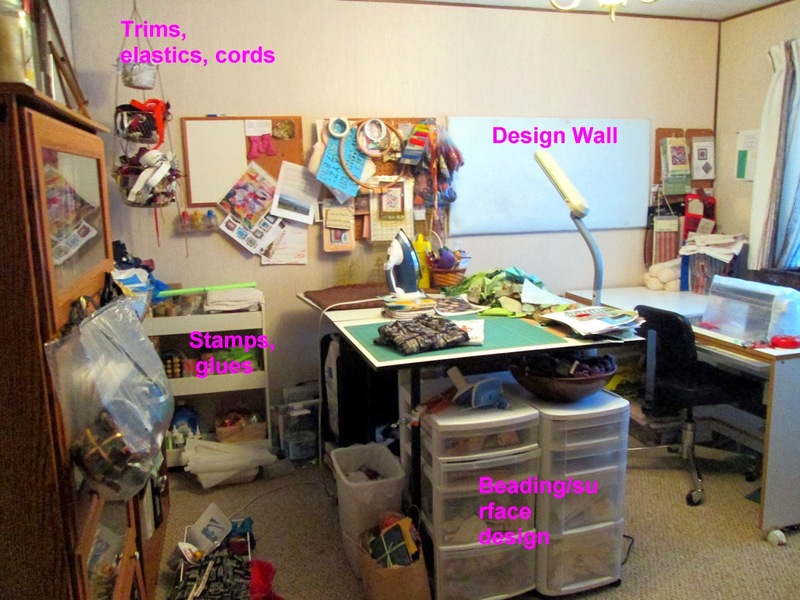 The blue binder on the far end of the sewing table houses my DMC floss, in plastic pocketed pages. The book case is a barrister-style which I like because it keeps out the dust. Lined up along the floor in front of it are baskets of fabric that I haven't hung on the triangular storage rack I mentioned last week, because being triangular, these would have to hang on the side nearest the window wall, making them awkward to get to. 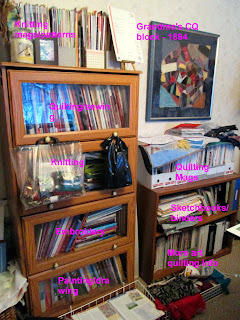 Next to the closed book case is an open one that stores magazines, binders from on-line classes, and sketchbooks. Above it, on the wall, is a family treasure: a "practice" crazy quilt block done by my grandmother, Maria Flood McIntosh, prior to her marriage, dated 1894. It's preservation framed with acid-free materials and special glass so UV rays won't damage it. I found it wrapped in tissue in the attic of my late Aunt Alice when I was clearing her house as she was going into nursing home. With the finished block were 6 larger ones in various stages of construction. I have played with some of them but the fabrics are pretty fragile, so I have no hopes of finishing them by hand, and they are stored away for now. 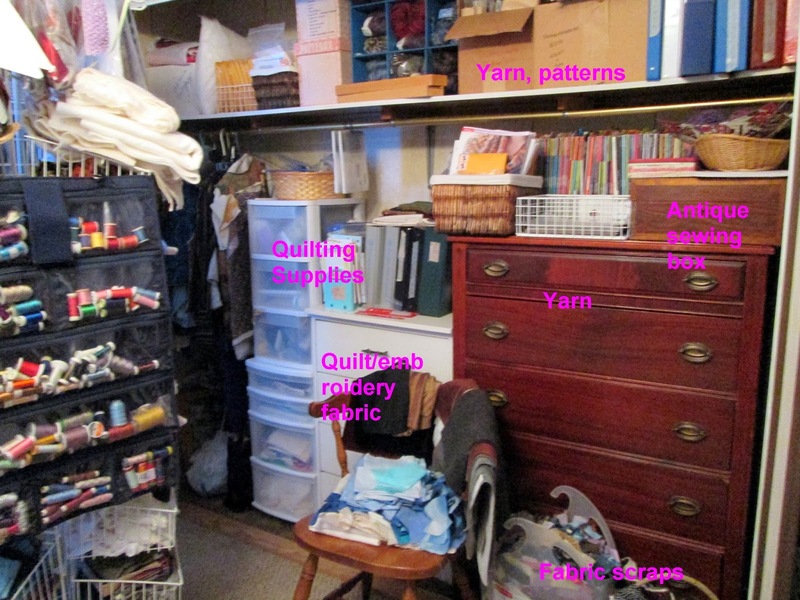 On the left side of the photo is a close-up of my thread-keeper, hanging on that triangular storage rack featured in the last post. Behind that is the Sears shoe caddy and cabinet for yarn storage. The closet you see here is long and narrow, as befits a clothes closet. The sliding doors were in poor shape so I took them off and had the track in the floor covered with a solid piece of wood. The shelf of the closet is filled with supplies -- boxes of quilting projects, embroidery patterns, boxes of fabric scraps (in baggies by colour), and binders of patterns for quilting, knitting and embroidery. Hanging in the back corner of the closet are thrift store finds -- a couple of jean jackets calling out to be embellished, and some silk blouses intended to be cut up for yet-to-be-determined projects. In the centre of the closet is a stacking plastic drawer system and next to it, a small white dresser. The dresser's top drawer holds linens for embroidery; the other 2 drawers hold specific quilt projects -- kitted, that is. On top of that dresser I keep a few binders from on-line course work. The large highboy contains yarn -- mainly quantities set aside with patterns for intended projects. I reserve the right, however, to change patterns at will, should I find a more interesting use for the yarn! ;-) On top of the highboy are more magazine holders -- Quilting Arts, Cloth/Paper/Scissors and other quilting magazines are stored here for easy reference. There's also a basket with patterns for filing, a white wire basket that holds mats and plastic packaging for my miniatures, and an antique sewing box made by my great uncle (maternal grandmother's brother) who was a skilled cabinet maker. The box includes a pin cushion and two "secret" compartments -- and a bit of wooden inlay in the top. I love it! The chair, as you can see, is a resting place -- not for me, but for whatever fabric I'm using at the moment or want particularly close at hand! And on the bottom edge of the photo, there are two baskets of scraps...ditto! There you have it -- my Main Sewdio Tour. 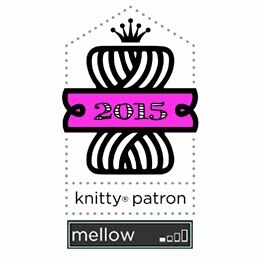 I'm linking up -- and checking out -- what others on The REAL Studio Tour have to share. Have fun this weekend, wherever you plan to play with fabric, fibre, floss, paint, paper and glue! I just love seeing how we all turn leftover pieces of furniture into perfect craft storage. I love your bookcases. I've been wanting some of those for a while. Looks great! You have packed a lot in that room. I really love your outdoor "sewdio"! 'Sewdio' - I love it! What a great word for the places where we create! Must say I'm with some of the other commenters in lusting after your bookcases. Thanks for sharing your space. I love you thread keeper as well as your storage ideas. Nice functional 'sewdio'! I like how you have hand work for your outdoors sewdio. That is something I'm working on - to have handwork to take along with me. What a great studio tour! Thank you for sharing and I love your "outdoor studio"